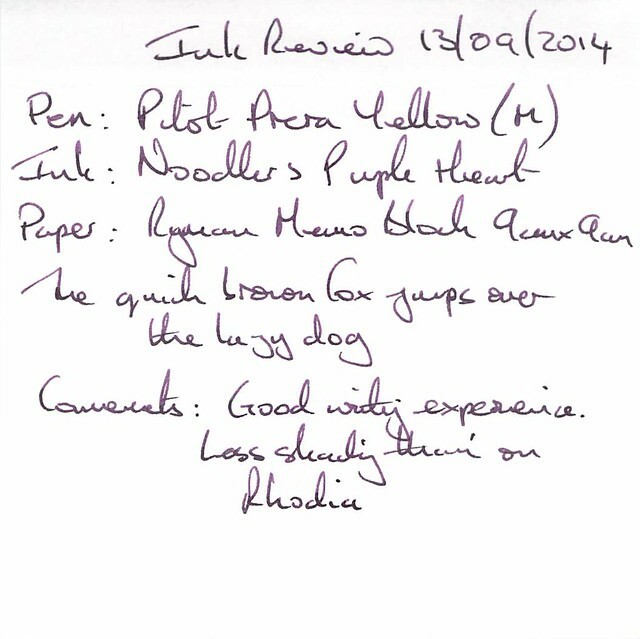 The next of this batch of ink reviews is for Noodler’s Purple Heart, a Goulet Exclusive ink. This ink is named after the after the medal awarded to serving U.S. military personnel who are injured or killed. 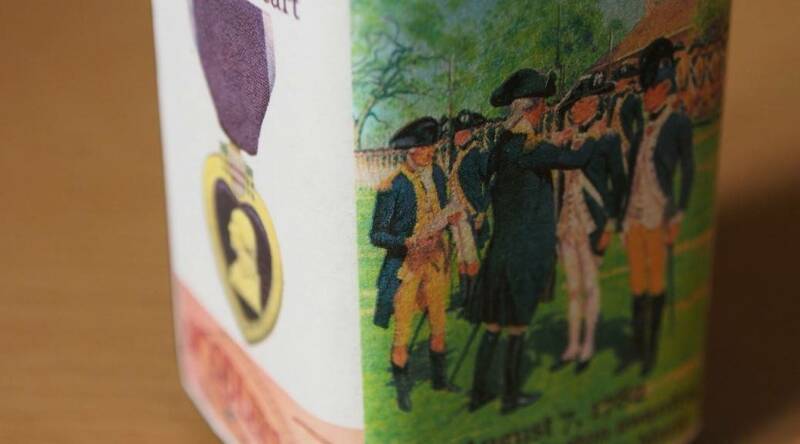 The label depicts George Washington awarding the Badge of Military Merit to soldiers, as shown in a painting by H. Charles McBarron. 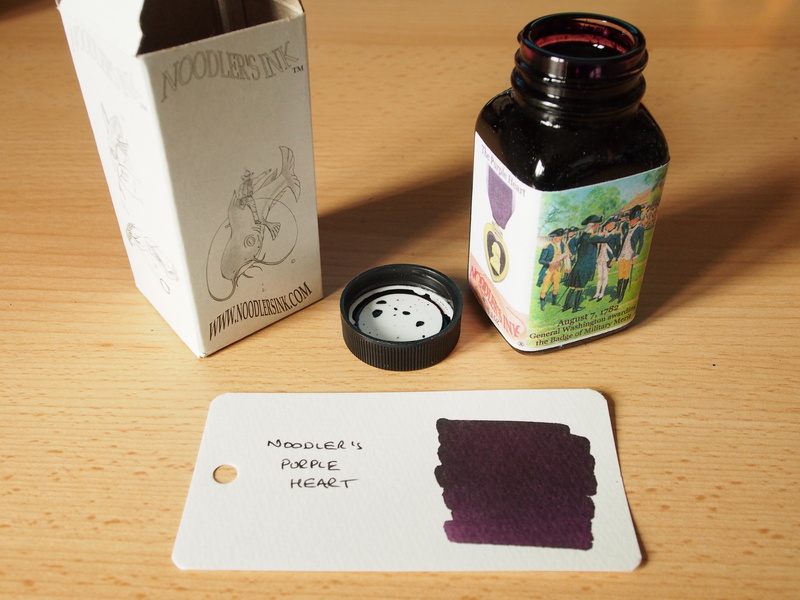 The label also provides a close up of the Purple Heart and the Badge of Military Merit, along with an eel – a clue that this ink is in fact one of the Eel Series, although none of my tests really show that property. I have not seen the real medal, only images on the web and on the bottle label, but the colour of the ink doesn’t really appear to be identical to that used in the medal, although it is very close. The medal tends towards a bluer shade of purple, while the ink tends towards red (almost grape). The supplier in this case is obviously the Goulet Pen Company. The ink was part of a larger order, so shipping was combined and can’t be quantified just for the ink. Putting shipping costs aside this would a low cost ink. The 3oz bottle and box were the standard fare. The test pen was a Yellow Pilot Prera with a medium nib. There was some water resistance and cleaning was easy. The drying time was moderate at around 30 seconds. 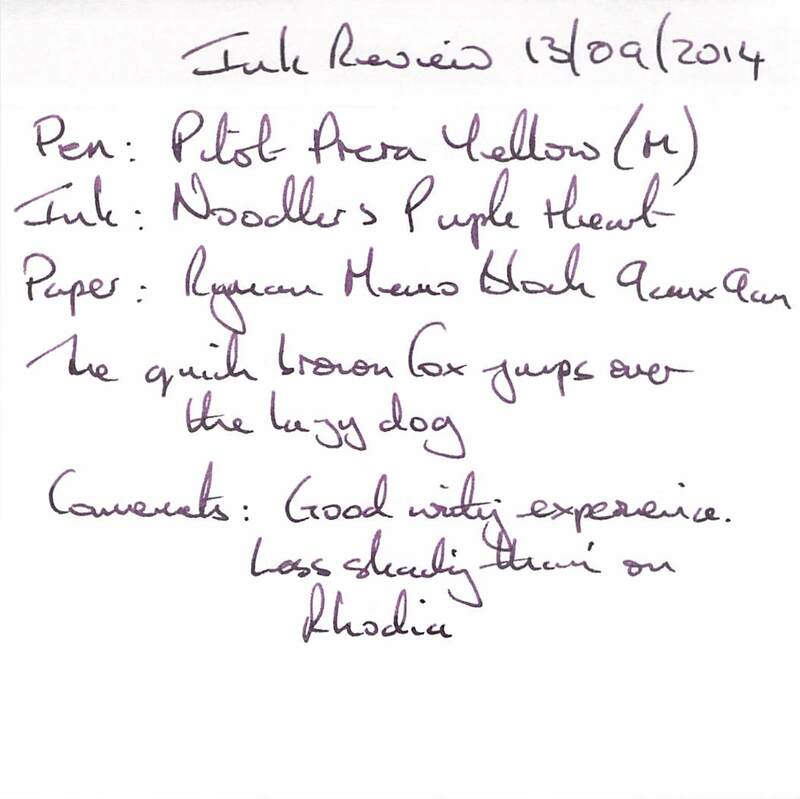 This a serious, deep purple ink, so is in the colour range that I like, along with some nice shading. 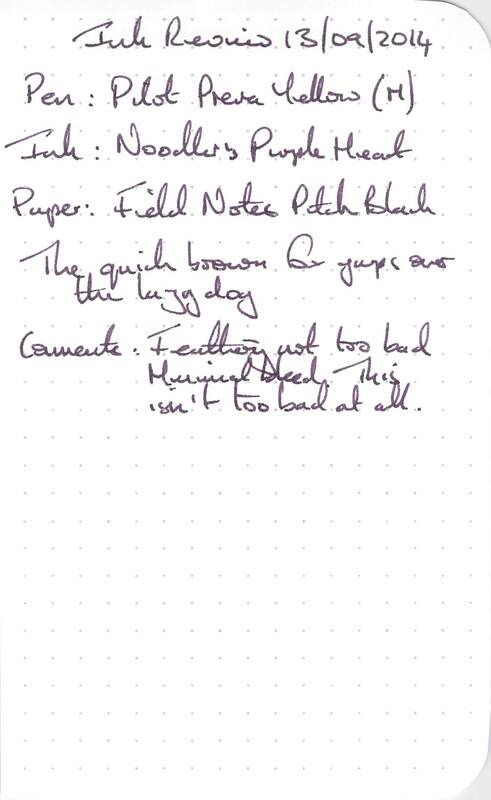 I didn’t experience any problems on Rhodia paper. Another good writing experience. Checking the writings samples again the shading looks the same as on Rhodia paper. The colour was a little less saturated and coverage was not so good, but the experience was still okay overall. 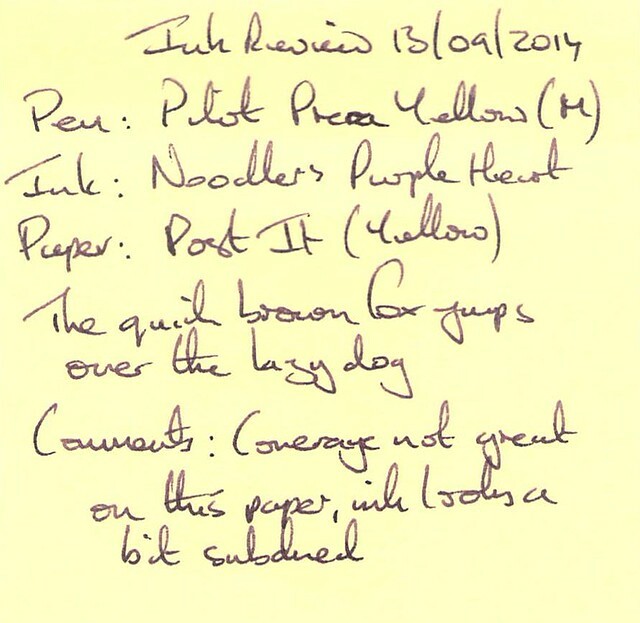 This was one of the best performing inks on this paper so far – not up to the standards of “normal” paper, but a quite satisfactory experience all the same. 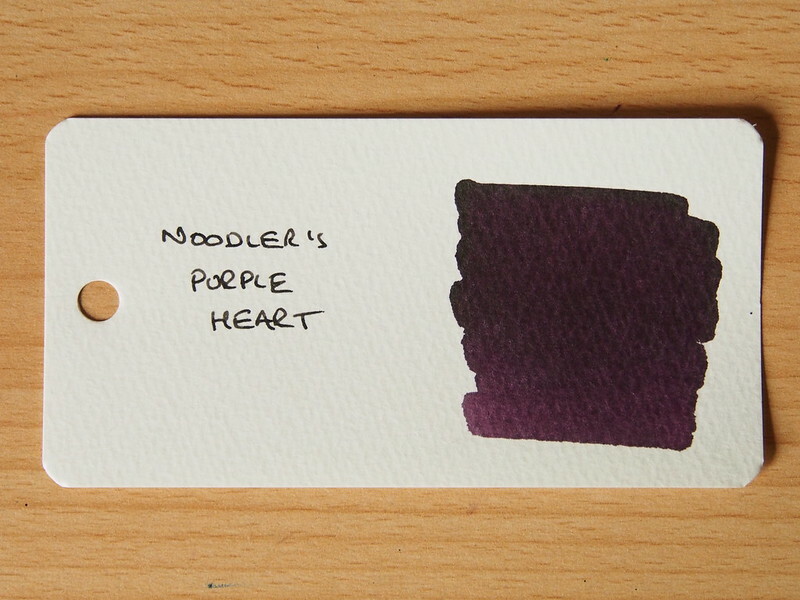 The Word Card really shows off the deep saturation and serious tone of this ink. 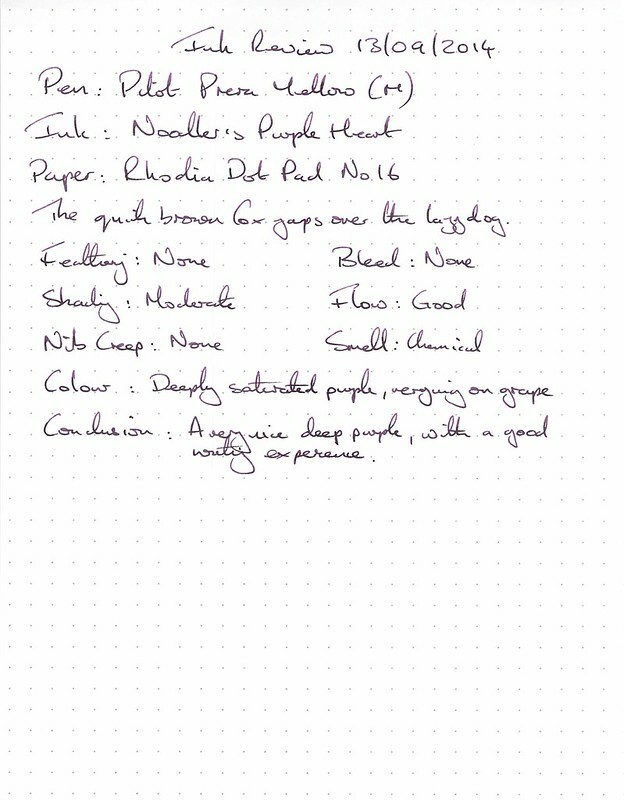 This is an attractive purple ink that performs well, suitable for personal note taking. It will feature in my rotation in the future.